The public comment window for the Waters of the U.S. rule closed on Friday, Nov. 14 – more than half a year after the regulation was introduced. The conversation on the rule has been highly contentious, drawing criticism from national lawmakers, state officials, agricultural associations and individual farmers, many of whom have voiced their concerned through public meetings, news articles, congressional letters, formal comments and thousands of posts on social media. The rule, a joint-proposal from the Environmental Protection Agency and the Army Corps of Engineers, aims to clarify what bodies of water the federal agencies can regulate. The agriculture industry has largely opposed the rule, arguing it will impede on farming operations with unnecessary and unclear regulation. 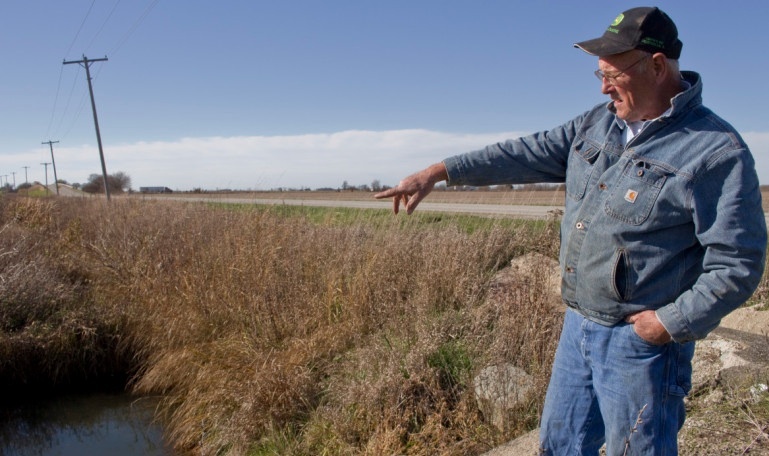 Champaign County, Illinois, grain farmer Lin Warfel points to a drainage area on his property on Nov. 5, 2014. For Warfel and others in the agriculture industry, the main sticking point on the rule is its added protection of seasonal and rain-dependent streams. 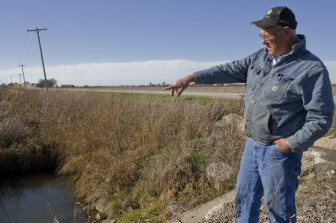 Many farms – including Warfel’s – have long drainage ditches that stay dry for most of the year, but fill up and connect to rivers during heavy rains. The proposed rule, which falls under 1972 Clean Water Act, also seeks to protect wetlands. With just a couple of days left before the public comment period ends, the proposed rule has received more than 12,000 formal comments. “The overriding concern of a diverse group of impacted stakeholders, including state leaders, is that the proposed rule will impose significant barriers to the advancement of innovative, state- and local-driven conservation and environmental practices that would actually advance our common goal of water quality,” Iowa Gov. Terry Branstad wrote in a letter to the EPA. The Illinois Soybean Association, the Illinois Beef Association and the National Pork Producers Council are just three of the groups that submitted comments, documented on Regulations.gov. “It is absolutely ridiculous to consider any puddle or amount of water that runs across a field, gold course, yard, park, ball field, as waters to be regulated as ‘Waters of the U.S.,’” wrote one Champaign County farmer. “For the EPA to claim jurisdiction over these ditches and water ways would severely impact the decisions I make over how I farm,” wrote another. Congressional records also show that nine U.S. senators, including Sen. Chuck Grassley, R-Iowa, and new Senate Majority Leader Mitch McConnell, recently signed their names to a letter directed to EPA Administrator Gina McCarthy, Army Secretary John McHugh and U.S. Department of Agriculture Secretary Thomas Vilsack. “As the Administration continues to extend the timeframe for finalization of the flawed WOTUS proposal, any further discussion of how agricultural activities may fit into this framework must allow for a transparent and public process in which the voice of American agriculture can be heard,” the letter, dated Oct. 23, stated. The American Farm Bureau Federation sponsored a handful of mass-mail campaigns that urged farmers to submit negative comments. Yet, some of the concern coming from the agriculture industry may be misguided, according to Gilinsky, who spent the summer and parts of this fall traveling across the country talking one-on-one with producers. 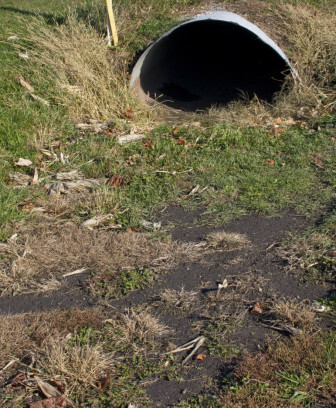 A drainage pipe is positioned on Lin Warfel’s property in Champaign County, Illinois, on Nov. 5, 2014. “Unfortunately, while many stakeholders in the agriculture community have brought up some very valid concerns with some of the wording that we’ve used and how it could be clearer, overall, there’s a lot of misinformation out there saying that farmers are now going to need permits to plow their fields,” she said. The proposed rule, for example, does not change the special exemptions and exclusions the Clean Water Act has provided the agriculture industry throughout the past 40 years. It also does not add regulation to farm ponds, and it specifically excludes groundwater. A Midwest Center for Investigative Reporting analysis shows that social media has played a key role in the public’s understanding of the rule. For instance, critics have used the Twitter hashtag “#DitchTheRule” to share why they oppose the Waters of the U.S. rule. Since August, the tag has been tweeted or retweeted more than 14,000 times. “In agriculture, we’re at a point where we want to really tell people, ‘Stop. Wait. Give us some relief, here. Back off,’” Warfel said. Various Iowa county boards of supervisors have submitted comments, often using the same wording, to show their opposition to the proposed rules. That wording is used in similar letters from county supervisors and commissioners from other states, as well, including Calumet County, Wisconsin; Del Norte County, California; and Cheyenne County, Nebraska. Robert Smith, chairman of the Harrison County Board of Supervisors wrote that the rule could impact county roads and ditches, flood control channels and drainage areas. “The proposed rule does not ‘reduce uncertainty’. It does the opposite by creating more questions than it answers,” he wrote. 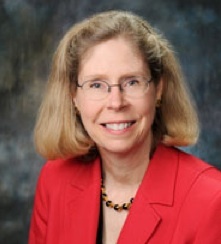 Wendy Wintersteen, dean of the Iowa State University College of Agriculture and Life Sciences, wrote that the rule will create uncertainty for farmers when deciding soil and water conservation practices. A group of northwest Iowa officials, the Iowa Drainage District Association, listed several concerns and mistrust of the EPA was among them. “The rule assumes you are guilty,” Executive Director John Torbert wrote in the association’s EPA comment. The Midwest Center for Investigative Reporting is an independent, nonprofit newsroom devoted to coverage of agribusiness and related topics such as government programs, environment and energy. Visit us at www.investigatemidwest.org/. IowaWatch is a member of the Midwest Center for Investigative Reporting. Reporting: Robert Holly from Illinois, Lyle Muller from Iowa.